About seven inches long and plump. Predominantly white on whole head, neck, rump, and underneath. Wings mixed black and white. Black scapulars (upper wing feathers), inner secondaries (middle wing feathers), end half of primaries (longest wing feathers), back and inner tail feathers. Darker in the autumn gradually becoming more white again in winter. 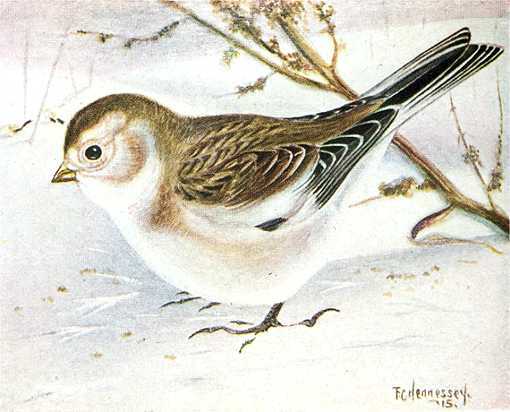 A bird of the tundra, circumpolar in the Arctic regions, Alaska, Canada, Greenland, Iceland, northern Scandinavia and Siberia migrating south in the autumn to the Scottish Highlands, over Europe, eastern Asia, Canada and the U.S., appearing around Hudson Bay around September and further south in about another two months reaching the upper U.S. around December. 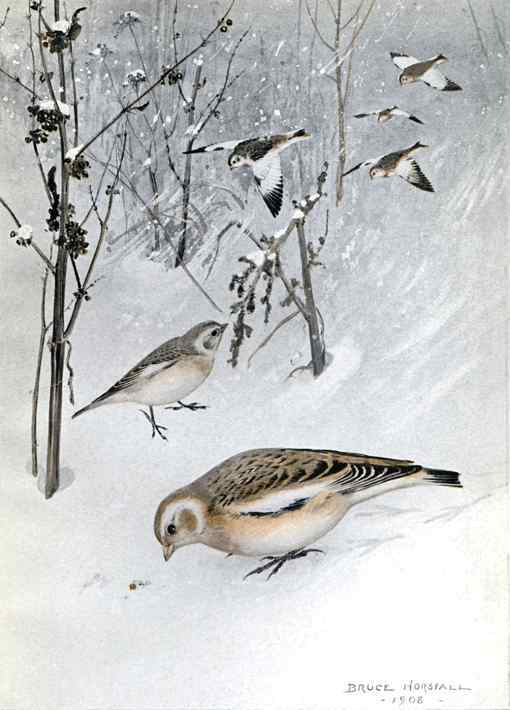 A few have been recorded nesting as far south as the White Mountains of New Hampshire. Normally they do not winter further south than Illinois or New York, but occasionally they wander as far as Kansas and Virginia. They are content playing and singing during snow storms when the temperature is thirty degrees below zero. Ground feeders of various seeds, buds, insect larvae and small shell fish. Flocks forage for weed shoots penetrating snow covered fields. Forced south not by the severe cold and deep snow cover so much as the deprivation of its food source, moving northward again as early as February. Build warm bulky nests of stems, grass and moss lined with feathers and fur hair in rock crevices on barren hillsides, in cavities in sand banks and in nest boxes. Females lay three to seven dull white speckled eggs with a faint blue-green tint. The Snow Bunting Birdhouse has a 5″ by 5″ floor, 8″ inside floor to ceiling, 1 3/4″ diameter entrance hole located 6″ below the roof and ventilation openings. Mount this nest box on a post or the wall of a house or shed. Remove the nest and clean the box after the season is past. About seven inches long and plump. Predominantly white on whole head, neck, rump, and underneath. Wings mixed black and white. Black scapulars (upper wing feathers), inner secondaries (middle wing feathers), end half of primaries (longest wing feathers), back and inner tail feathers. Darker in the autumn gradually becoming more white again in winter.